The SST 6 Hybrid has impeccable functional and stylish details such as the removable heels and athletic stitched lines. Not sliding correctly? Switch out soles and heels to get a personalize slide that fits you. 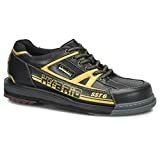 Rock the lanes with these black and gold shoes!